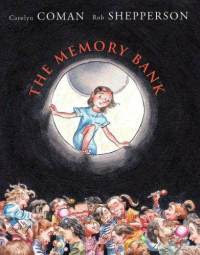 The Memory Bank I think is a very sad book. In the first few pages, the two sisters Hope and Honey Scrogins get ready in the morning. The next page is Hope noticing that Honey forgot her whistle and then Honey comes back in to get it. After that it skips to their family in the car and their parents kick Honey out of the car and they say "forget her ". After that Hope tries to find her sister using the Memory Bank, the one bank that keeps dreams and memories, the one bank that can help Hope find her sister and solve that problem once and for all. I think that people of all ages will love this unforgettable story of two sisters that will never forget each other. I almost cried my eyes out but it got better by the end. I think that older sisters will like this story but they will be hit in the head by the beginning of the story. It is also part graphic novel, which means that a lot of it is in pictures. This book is very enchanting and lovable book. I hope you love this book as much as I do! The story reminded me of the feel of a Roald Dahl, but the illustrations are used the way they are in HUGO CABRET. I just found your blog, and I am so impressed! You've probably heard this before, but you are an excellent writer, and I'm enjoying reading your reviews. I wish I could get my sons interested in writing book reviews! They're 16 and 12, and they like to read, too. I also write reviews of kids' books, some for kids your age and some for teens. This book sounds wonderful - thanks for the great review!